The European Union Intellectual Property Office published a chart to advocate the superiority of the trademark registration over the domain registration as a tool to protect a brand or a business name. But these information are legally incomplete and technically wrong. First: comparing internet domains and trademarks is like comparing apple and oranges. A domain is just a domain, i.e. : a field of a record belonging to a DNS and it is not equivalent to a trademark. This field can be filled by (almost) any alphanumeric sequences, including combinations that have a meaning in some specific language. 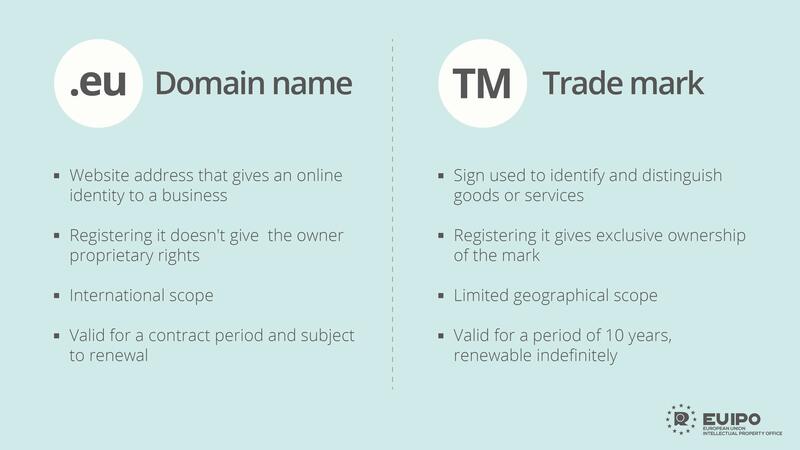 But a domain, per se, IT IS NOT A TRADEMARK, the latter being, instead, a legal rather than a technical notion. Secondly: domain doesn’t equals website. As much as this may surprise a lot of “experts” out there, a domain can be used just for email, FTP (yest, that’s still working) etc. The Internet is not only HTTP. Fourth, a trademark registration too can be challenged outside and in Court. A questionable trademark can always be challenged, and holding it doesn’t shield the registrant from legal quarrels.